Once upon a time, a shawl edge that was not supposed to curl did curl, irreparably. I had to rip out perfectly good knitting, which made me crabby. When you find yourself in the situation where you need to rip back, what is your advice on getting those live stitches back onto the needles? That paralyzes me! I find it so difficult to get every stitch back onto the needles because they often drop down to other stitches, etc. Any tips? Tammy, try a needle a couple of sizes smaller than you used for the project and don’t worry about what way you’re putting them on the needle, if a stitch has dropped down a row or two go ahead and pick it up and correct it later. Pick up stitches in the ‘wrong’ direction, then use the appropriate size needle to move them to the correct direction, orientation and ladder back up the stitches that were down a row or two. Or, the way I do it is put them on in the correct direction on a smaller needle and then as I work the first row I fix the orientation or ladder back up any that are down a row or two. My cats are the same. Though I think sometimes they will place themselves in the optimum spot to be MOST in one’s way. Also, I have found it helps to let the knitting sit overnight (or for a day, or whatever). If the yarn has a chance to get used to being in stitch form, you’re less likely to lose stitches as you unravel and then pick them up. 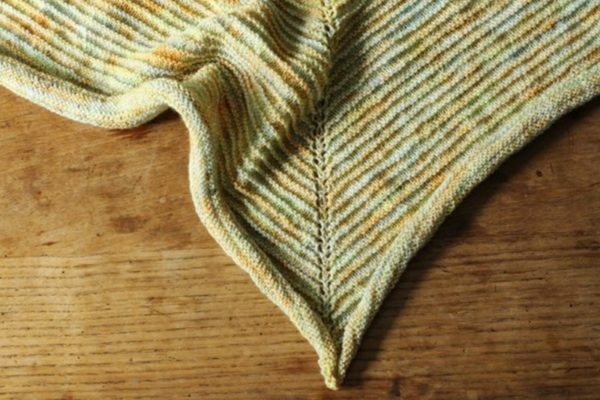 Here, when the piece has been blocked, the yarn is somewhat pre-kinked into stitch-shape, and is less likely to unravel beyond what you’d like. Also, letting a problem sit for a day makes it less likely you’ll do something drastic and unnecessary. Tammy, next time think about threading the stitches of the row you want to get back to onto the skinniest longest circ you’ve got (2 or less is ideal). Then Frog without Fear. Some stitches won’t make it onto the needle which is why we have safety pins. I second the recommendation not to worry about whether they’re facing right because you can either twist ’em back as you knit the row onto the correct size needle, or knit through the back of the twisted ones as you go. Yes, it’s a pain but relieves my anxiety about the process, especially if it’s a tricky or stranded pattern. Tammy, before you rip back you can put in a ‘life line.’ Take a large-eyed needle that you would use for finishing/sewing with yarn and thread it with a scrap yarn in a contrasting color to your project. Decide how far you need to rip back and then run that scrap yarn through the stitches in that row. When done correctly, you should not lose any stitches. You will have to reorient stitches when replacing them back on the needle. This Afterthought Lifeline tutorial may be helpful. Would you consider creating a photo collage of cats ‘helping’ us knit, sew and crochet? I’m sure we all have a picture or two! Of course I would. 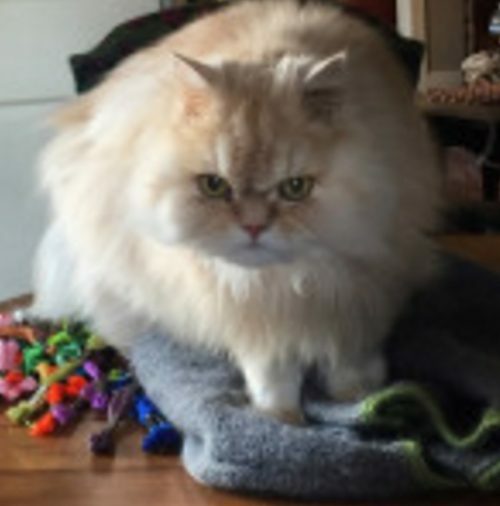 Please post your photos of “helpful” cats on Instagram with hashtag #helpfulknittingcats. Thanks, everybody, for giving such cool-headed counsel. I can’t wait to screw up something again so I can calmly take all this advice and zen out about it all. I insert a lifeline using another circular needle instead of thread. I pick up the right hand leg of every stitch in the row I’m ripping back to. No worries about reorienting stitches, you’re ready to go! Pam’s suggestion is genius!! But when I “can’t” let something sit overnight, I rip back one row less than I need to. Then tink that last row, and hopefully I had enough forethought to include a smaller needle in my knitting bag. Otherwise I make it work, as knitters do.